The prospect of a government shutdown appears less likely after President Donald Trump dropped his demand to include funding for a proposed border wall with Mexico in must-pass spending legislation, and a new Morning Consult/POLITICO survey suggests most voters think that’s the right move. 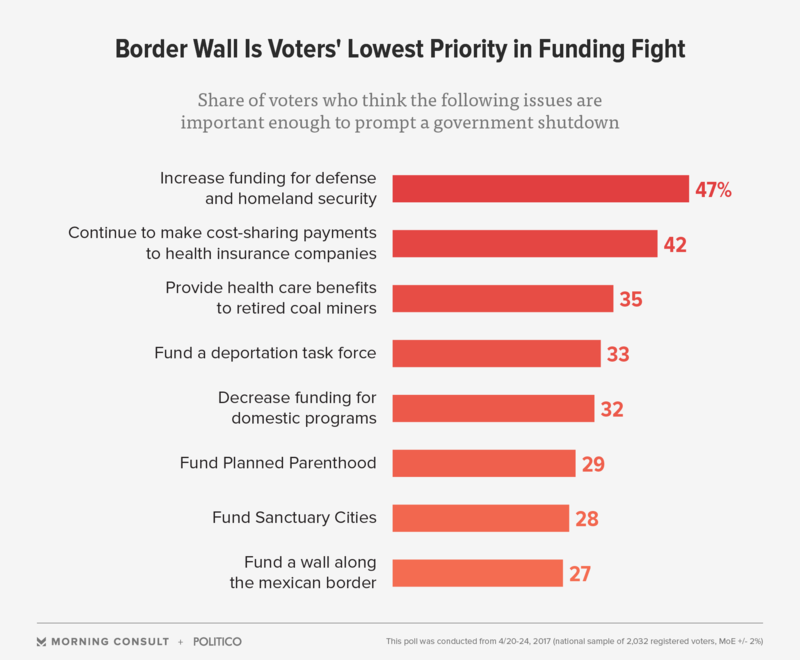 In the poll conducted from Thursday and through the weekend, only 27 percent of registered voters said funding the wall was important enough to prompt a government shutdown on Saturday — making it their lowest priority. Sixty-one percent of voters said it wasn’t important enough to prompt a shutdown. The idea of a shutdown over wall funding was more palatable to Republicans. Four in 10 GOP voters said the issue was important enough to prompt a shutdown, compared with 19 percent of Democrats and 21 percent of independents. Still, roughly half of Republicans (51 percent) said it wasn’t worth a shutdown. Americans are generally allergic to governing by crisis. Almost 7 in 10 (67 percent) said members of Congress should take all necessary steps to avoid a shutdown, and try to achieve their policy goals another way, up just slightly from earlier this month. Again, Republicans (24 percent) were slightly more willing than Democrats (15 percent) or independents (17 percent) to back using funding lapses as leverage to help lawmakers achieve policy goals. Increasing spending for defense and homeland security was the only issue deemed important enough by a plurality of voters to prompt a shutdown. About half of them (47 percent) said the issue was important enough to prompt a shutdown, while 39 percent said it was not. Voters are split, 42 percent to 42 percent, over whether the continuation of cost-sharing payments to health insurance companies as part of the Affordable Care Act is worth fighting in the spending plan. Congressional Republicans have fought the payments in court, and Trump has threatened to eliminate them in a bid to bring Democrats to the table for health care negotiations. Top congressional Democrats have said the payments are non-negotiable, and half of the party’s voters (50 percent) said they’re ready to shut down the government over the issue, while 36 percent were not. Another potential sticking point in negotiations is on securing health benefits for retired coal miners, with a number of lawmakers from Coal Country demanding a permanent extension. Voters are not on board: While 35 percent support it, 44 percent oppose it. Voters in Midwestern states were more likely to support a shutdown in a bid to secure those benefits, but they were still split, 39 percent to 40 percent. With Republicans firmly in control of both the House, Senate and the White House, they’re set to take most of the blame if a shutdown were to happen. Three in 10 voters (31 percent) said they would blame Democrats in Congress, while half (51 percent) would blame the majority party — 28 percent said Republicans in Congress and 23 percent said Trump. Among Republicans, nearly half (47 percent) said they would blame congressional Democrats. But a quarter would blame congressional Republicans, and 14 percent would blame Trump. The national, online survey of 2,032 registered voters was conducted April 20-24. It has a margin of error of plus or minus 2 percentage points. See the full results here.